9:10 a.m. Character Blocks: in 5 small groups, students use building blocks to prioritize traits. Report out to whole group. 12:30 p.m. Share plans with large group. The Mashantucket Pequot Tribal Nation hosted our first workshop of the year. We welcomed Fitch High School into our diverse group! LHS students...we will meet after school on Thursday, Sept 26, for just 10-15 minutes to hear your nominations for 10th graders who might be well suited for MTW. We'll meet in the Career Center at 2:10 on Thursday. 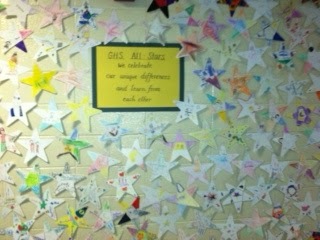 Attached are photos of the Gallup Hill School All-Stars that are beautifully displayed in our front hallway. Gallup Hill All-Stars We celebrate our unique differences as we work together! 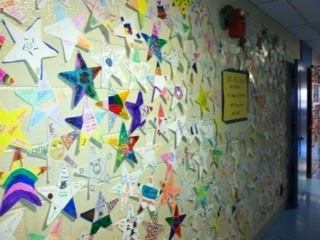 Many students, parents, and staff have commented on how great all the varied "stars" look together, and what a powerful statement the display makes to help celebrate our different talents. Please extend a heartfelt thanks from the GHS staff to the amazing More Than Words group for taking the time to plan such a valuable lesson on tolerance. Our students truly enjoyed the read aloud, the group activity, and the art project that worked to solidify their shared learning. We will continue to not just tolerate, but to value our unique differences daily as we work together and learn from each other.